When visitors to the south of France put “wine tour” at the top of their list of things to do, a Châteauneuf-du-Pape wine tour quickly comes to mind. 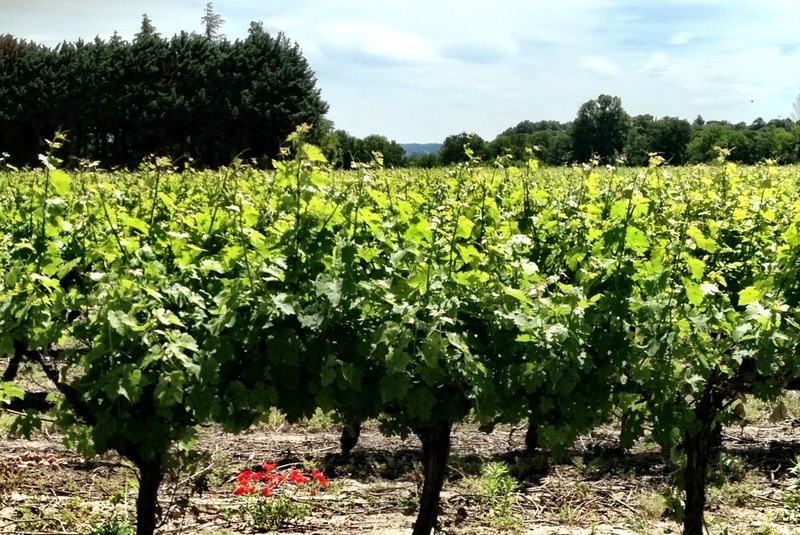 The wine growing region that covers approximately 3,200 hectares (12.4 miles) of land in the Rhone valley is home to some of France’s most well known … and pricey wines. Unless you know a lot about wine, you might be surprised to hear that “Châteauneuf-du-Pape” is not just a wine growing region. It’s also a historic “monument” as well as a town in the Vaucluse department in the Provence-Alpes-Côte d’Azur region in southeastern France. The Châteauneuf-du-Pape “monument” is what is left of a fourteenth century chateau built under the auspices of Pope John XXII. Towering above the fields and vineyards of the region and visible for miles around, the chateau is among the last vestiges of the Roman Popes who ruled from nearby Avignon from 1309 until the Schism of 1378. “Châteauneuf-du-Pape,” translated “new castle of the Pope,” was built to be the summer home of the Popes. The town of Châteauneuf-du-Pape is a small village with a few restaurants and lots of wine sellers. It reminds me of a wine smorgasbord. You can hop from one “degustion” to another. Just outside the town center, there are dozens of wine producers devoted to making and selling their own special varieties of Châteauneuf-du-Pape wines. Farther out you’ll find private and “open to the public” wine domains with acres and acres of vineyards. Some new, some old. 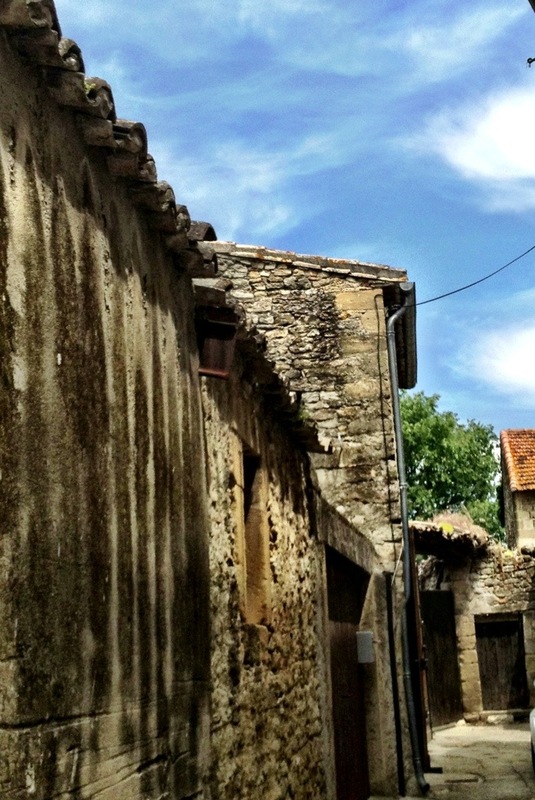 Some that have been handed down through centuries of vingerons, complete with ancient stone chateaus and wine caves. The Barefoot Blogger has visited Chateâuneuf-du-Pape to check out the wines on several occasions. The first was to see the territory by myself, next was with my cousin visiting from Arizona. The last time was to treat my visitor from North Carolina to her first wine tour in France. 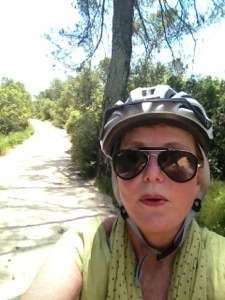 I called on my friend who’s considered to be one of the best guides in the area — Sophie Bergeron of Travel in Provence. During the half day we spent with Sophie, I found out why she’d earned her good reputation. She knows her wine. From working in vineyards to selling wines, Sophie’s been in the business since she was a child. The no-nonsense tour guide educated and entertained us. The wine “lesson” was complete with charts and maps and wine tasting. Next we were off to the wineries. Sophie’s choice of wineries to visit was brilliant– including one that appeared to “blessed” by the ancient chateau’s tower because of its proximity. How much fun to get “up close and personal” with the winemaker and his crew. Love the wine and the wine maker! For more information about Sophie Bergeron and Travel in Provence, visit the website. If you would like to keep up with the day-by-day adventures of the Barefoot Blogger, join the conversation on FaceBook and Twitter. Had the Barefoot Blogger known lavender fields are so close to Uzes, and how fabulous they are in person, I would have been visiting them much before now. Thank goodness I found out how to get to some of the best fields. There’s more than one way to keep lavender year round. It’s more lasting than sachets and bouquets. Last week I discovered lavender salt! There’s a tiny village just outside Uzes that sells all types of local specialties, including olive oil that’s milled on site. The store and the moulin à huile are inside a garage attached to the proprietor’s home. The most surprising discovery was the building attached to the opposite side of her house — the remains of a church from the 11th century! This is part of the joy of living in this part of the world. A tiny, out-of-the-way place can be an amazing find. Ancient buildings are still standing, alongside some of the most unique local items for sale. So far, I’ve tried the lavender salt. It’s a winner. The rest is yet to be enjoyed! The French farmer who sells goat cheese at the Uzes Saturday Market is one of my favorite vendors. He’s certainly one of the most colorful. Each year he stages an event at his farm and invites the public. Having no idea what to expect and having nothing else to do, I took him up on the invitation. The farm was only a few miles outside of Uzes. “Pastoral” doesn’t even begin to describe the farm. Never would I have guessed that the modest man selling the BEST chevre at the market has a farm and family business this large scale. 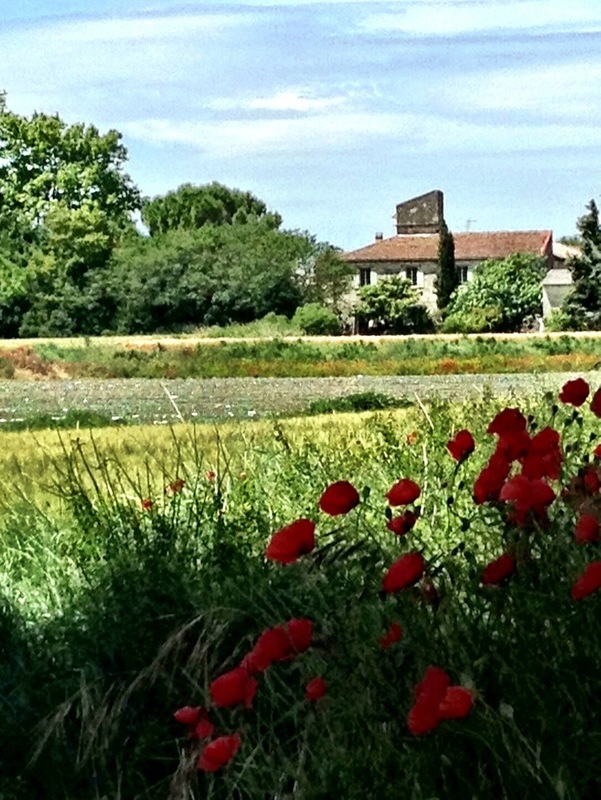 Being a “city” girl, spending an afternoon on a farm in the south of France was a happy surprise… and a lot of fun. Hope you enjoy it and pardon the puns. Check out the story about the green grocer in Uzes where you can buy all types of chevre and more! A Dream Vacation in the South of France. I’m feeling pretty smug these days that I get a south France holiday everyday. I’m sorry, but it’s true. I feel like I’m the luckiest person in the world to be here. Lately I’ve had more good luck to be included in the travel plans of my “blog world” friends. Some of them you know since I talk about them a lot — Nancy McGee from Absolutely Southern France and Yetunde from Cook’n With Class Uzes (and Paris) and Carolyne with Perfectly Provence and Edible Heritage are now part of my “gang,” too. While I was still in the States, Nancy put together a whirlwind tour for the four of us, upon my return, to visit in Uzes and Sete. She arranged the trip with the tourist agencies from both cities so that we could learn more about the towns and help promote tourism — as if I didn’t already promote them. Sete and Uzes are two of my favourite places in the world. In three days we stuffed in so many activities and sights that it’s hard to tell you about it all. Perhaps a synopsis will do for now and I’ll write more about each place in later posts. So here goes..
Nancy and Carolyne arrived at my apartment in Uzes around 5pm — just in time to meet Yetunde for our historic tour of Uzes. We were hosted by Fadila, our host in Uzes, and our guide from the tourist agency. Starting with the Mairie (town hall) we visited the inter-court of the Duché and heard the history of the “castle” and the three main towers in Uzes. A visit to the Saint Théodorit Cathedral with its Fenestrelle Tower helped explain some of the religious background of the town — which is both fascinating and complicated as this place was once a very important bishopric. If I thought I knew a lot about Uzes I was fooling myself. The history of the town is like peeling an onion. The more you learn, the more there is to know. A bit of rain stalled our tour of the city, but we continued our history lesson inside the Hotel d’Entraigues where we were treated to wine, aperitifs and an amazing dinner. Fortunately the raindrops stopped falling in time to view the hotel’s amazing views of the town from its rooftop… and the pool. Early morning the next day we grabbed a croissant and coffee and hurried off to meet the chef and students of Cook’n With Class. It was market day in San Quentin la Poterie and we were to choose and prepare a menu in the Cook’n With Class kitchen from the day’s best finds. … and the luxury hotel in Castillon du Gard – Hotel Le Vieux Castillon . What a view!! If you think our day was finished, you’d be so wrong. On to drive to Sete! Stopping off just long enough to drop our luggage at Nancy’s AIRBNB after reaching Sete, we were whisked away to the beach. There we were met by our friend Marie-France from the Sete tourist office and treated to an amazing dinner at Le Cabanon de la Plage. Nancy’s Absolutely Southern France weekly gourmet tours are quite the “thing to do” in Sete these days. In fact, Nancy has recently been named “Entrepreneur of the Year” for the entire region of France. It’s no wonder. The Canadian-born expat who has lived in the south of France for thirty years is a fountain of knowledge. Her tour not only includes the city markets of Sete, she also tells of the history and architecture that makes the town so distinctive and compelling. Here are just a few of our stops along the tour. Finishing our gourmet tour of the city we were invited to a seafood FEAST at the waterside restaurant Oh Gobie. There we joined the restaurant owner … and an uninvited guest. Probably the most unexpected opportunity Nancy and Marie-France opened up to us as guests of the tourist office was to visit the fish auction house in Sete. First of its kind to be automated and computerised, the fish auction occurs each weekday in the late afternoon — just in time for the fishermen to deliver and sell their catch of the day. Fancy a South France Holiday Tour? The best thing about the whirlwind tour of Uzes and Sete is that it’s available to everyone. Most of the activities are free. 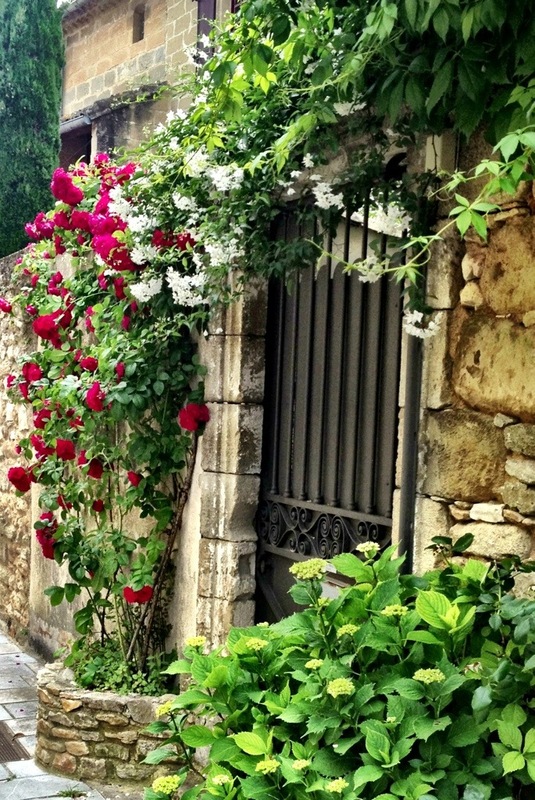 You just have to show up in Uzes or Sete to enjoy the scenery, the history and the ambience. For Nancy’s Gourmet Tour, contact her at Absolutely Southern France, and for Cook’n With Class Uzes, learn more and contact Yetunde here. Links to the hotels and restaurants mentioned are “hot” in this post, so learn more as you please. For any additional information, feel free to send me a note at deborah@bfblogger.com. There will be more posts to follow about this experience with more stories and photos. Hope you enjoy! Continuing on my trip down memory lane. It was three years ago that a solo holiday in Uzes turned into a dream come true. Long distance bike riding isn’t my forte. Tootling around my neighborhood is about the sum of my biking habit. The self- designed bike tour planned for today was supposed to be fairly short. Or so it appeared to be on the map. The idea for the trip was Oliver’s, the cutey from the bike rental shop. (See yesterday’s blog) The trail map he gave me looked simple enough to follow. Problem was, I discovered, the bike routes take you the farthest possible distance to get to any destination. I’m not saying the trail wasn’t scenic. There were no major roadways or traffic to spoil the views of the places I ventured today –from Uzes to St- Mediers to Montaron and back. Oh that I had heeded his advice. The next section of the road was a killer. The lanes of the trail were piled with sand and the route was mostly uphill. After a few minutes trying to plow through the sand, I resorted to pushing the bike. One reason I went on this excursion was to find a quaint town with a memorable cafe where I could have lunch. Walking the bike through St-Medlers, I saw no restaurants, cafes or sundry shops. In fact, the place was rather deserted. Montaron was off the bike trail, yet clearly, it was just down the main road. Downhill! When I arrived I literally staggered into the first restaurant I came to in the town, Passing through the bar area, I took three steps up to the tables in the outdoor covered patio. Dropping down into a chair, I was immediately met by the waiter. Apparently I looked as desperate as I felt. The waiter hustled to bring a pitcher of water to the table – with ice. Not long after, I finished lunch and a cold glass of beer. Know why I said the bike route was the longest route possible to anywhere? The road sign in Montaron told me so. Four kilometers to Uzes. I had traveled at least ten kilometers from Uzes to get here. I took the main road back. 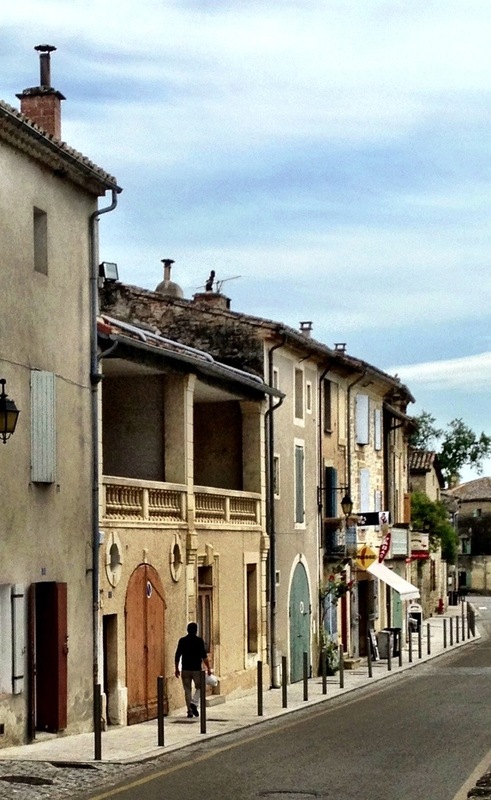 When the Barefoot Blogger decided to travel to France, this blog was born. It was intended as a “letter back home” to those I know so they could keep up with my adventure. Little did I know that the blog would take on a life of its own. Now it introduces me to new friends from around the world. Andy Newman, an artist from Massachusetts who lives in France part of the year, made contact after reading a blog post about the Luberon. Not only did he recognize the location of each of the photos in the blog, he had paintings that looked like they were created at the very same spot. As we passed emails back and forth over the next months, we were amazed at the similarities in my photos and his art work. This is now hanging on my wall! Before Andy and I met in person, you may remember a blog post about this interesting man who had put aside a prosperous law practice to be an artist. Needless to say, when Andy and his family were in France this summer, we had to meet. He was presenting his work in Tresques, a quaint village that’s less than an hour from Uzes. It was a great day trip through beautiful countryside to visit the exhibit and the town. As you can see from another “art imitates life” painting by Andy, the road to Tresques is lined with plane trees as far as you can see. He asked me to invite you all! Some of you remember PigPen in the Charlie Brown cartoons who always had a cloud of dust following him. Well, the Barefoot Blogger has a little cloud that has “trouble” written on it that seems to hang over me. My friend, Geoffrey, used to be the one who always came to my rescue. Since his phone now switches straight over to voicemail when I call, my safety net has expanded a bit. For example, remember Christian? The friend who saved from sleeping on the curb when I didn’t have my keys when I returned to Uzes in June? (Click here if you’d like to read the post.) Since Christian and the key episode, I’ve stayed pretty much out of trouble. Until last week. This time it was a real doosey. It was Thursday. I’d spent the morning picking grapes at a vineyard near Castillon-du-Gard for the small winery, La Gramière. When I parked “Lucy” in front of the pump the nice lady who owns the station came out to speak with me. Because of my bad French we awkwardly passed pleasantries back and forth as I fumbled to put the fuel nozzle into Lucy’s tank. My concentration was on putting together a few coherent statements in French. The next day, Lucy and I set out for the vineyard to help again with the grape picking. When we left the underground garage in Uzes, Lucy started puttering. She has always run like a top so I ignored her “hiccups.” Until we were down the road. A flash of heat came over me. “A catastrophe?” I said to myself, “ahh… Lucy’s just got something stuck in her pipes.” Then I hit the gas pedal so Lucy could blow whatever was in there, out of there. “Got to get back to Uzes right now,” I told Amy, apologizing for dropping out of the work crew. Back on the road I picked up the phone and called Geoffrey. Twice. The calls went directly to voicemail. Lucy was really hurting now. As we were chugging along we passed the turnoff to a small village I’d visited before. “Paschal!” I shouted to myself. Pachal is a friend of Geoffrey’s who designs swimming pools … and … he’s a master mechanic! “Bonjour? This is Deborah,” I said to his wife who answered the phone. “You won’t believe what I’ve done,” I exclaimed. Going over the gas saga and recalling that I had used the “green” pump to fill Lucy’s tank, I waited on the side of the road with Lucy to hear back from Paschal. Lucy coughed her way to Paschal’s house where she took her last breath. I left her for a diagnosis and, hopefully, a cure. “Say no more …” I had visions of Lucy being hauled off to the trash dump. Sunday morning I received a call that Paschal would meet me at a cafe in Uzes to hand over Lucy’s key. She was OK! And the cost for her repair was very reasonable …. including a full tank of DIESEL! Yeah Paschal!!! Now I don’t have to worry about putting petrol in Lucy’s diesel engine anymore. One of the hardest parts about visiting a new place is knowing exactly when during the year you want to go and what you want to see when you get there. 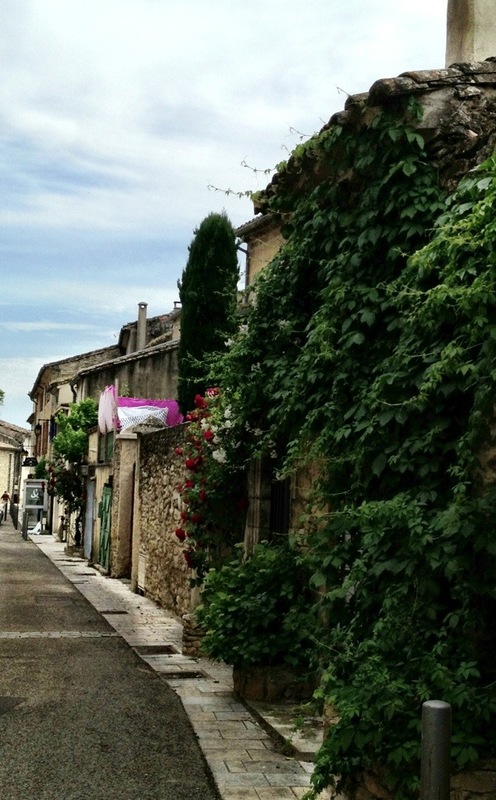 Now that the Barefoot Blogger calls Uzes “home,” here are some hints for a one day Uzes visit. On this trip you’ll have time to experience the rhythm of the town. That’s the best way to see it. When you arrive in Nimes or Avignon, there is bus service to Uzes with regional buses that depart on a regular, reliable schedule. The bus station in Uzes is in the middle of town, number #6 on the map below, close to most destinations in the historic district. “How to Get to Uzes” from other locations. Visit on a Saturday or a Wednesday for a market day in Uzes. Both the Saturday and Wednesday markets in Uzes are centered in the Place aux Herbes. It’s at #17 on the map below. Start out early in the morning on whichever market day you choose because the crowds start arriving around 10am. In the summer, you will be shoulder-to-shoulder with other tourists by noon. Saturday Market – When I visited Saturday Market in Uzes for the first time, I fell in love with the town. In fact, Saturday’s one of my favorite days of the week living here. The market vendors are in the Place aux Herbes with fruits and vegetables, cheeses, and all the flavors and foods that make this part of France so wonderful. Throughout the plaza and along the main avenue that circles the historic part of town, more vendors line up side by side selling men and women’s clothing, shoes, jewelry, hats and more. Musicians are on almost every corner playing French, Spanish and even Dixieland sounds. “Cat” with beautiful leather bracelets, located on the main street of town. Wednesday Market – The market on Wednesdays in a scaled-down version of the weekend event. Most of the vendors are selling food items that are local to the region. The market is mainly in the Plaza aux Herbes which gives visitors a chance to get a good look at the permanent shops located along the main streets and alleyways. Stop for lunch at one of the many restaurants along the boulevard or plazas. Take your choice of restaurants along the main avenue for lunch. Make yourself comfortable, like the French do, and take a long — sometimes two hour — break to eat, drink wine and relax. Most restaurants serve from noon to 2pm. If it’s a very busy day in town, scope out a place you want to stop for lunch before market, then make a reservation for “dejeuner”. Stroll through the historic area (map above). There are so many things to enjoy seeing, like the Medieval Garden, the Fenestrelle tower, and the Cathedral of Saint Théodorit with it’s classic French organ. Pull out your camera and capture some amazing photos that the people and town provide. 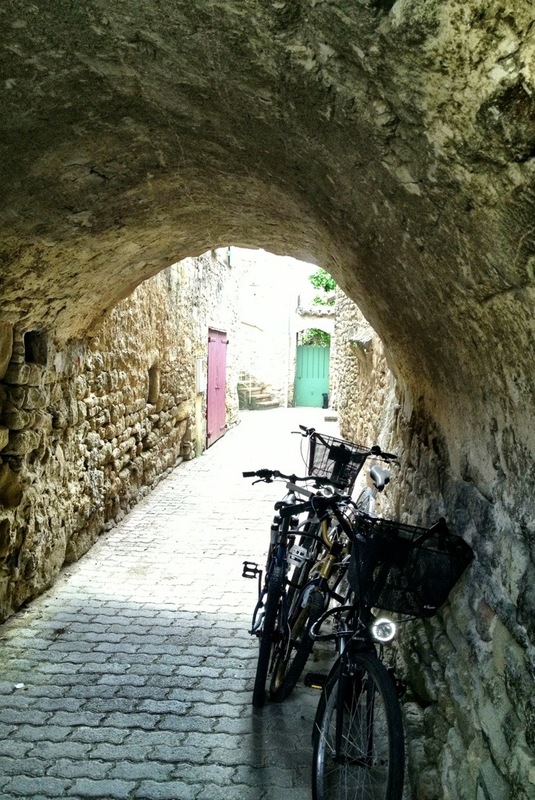 Narrow, cobblestone streets lined with 12th century architecture are everywhere. 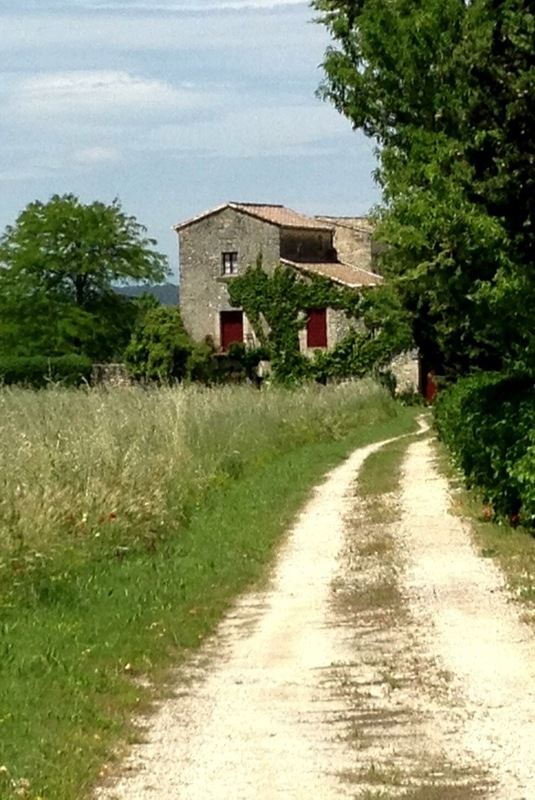 Visit a special hideaway frequented by Uzes insiders: Valle de l’Eure. It’s not easy to find but it’s worth the venture. Make your way back to the center of all the action — Place aux Herbes — to enjoy the fountain, shop! and take in all the sights and sounds around you. On market days, the vendors are out of the way and the plaza is back in time for you to enjoy a glass of wine, a pastis or an aperitif before dinner. L’atelier des ours with “Bobo” fashions like none other! Dinner at a restaurant with an outdoor patio. If you can stay long enough for a lovely dinner under the skies, there are several nice restaurants with outdoor patio/gardens. If there’s a crowd in town, you’ll need to make a reservation in advance. They will welcome you anytime around 7pm, but not before. One of my favorite places is Les Comptoir 7. The food is excellent and the service is superb.